Hooray! It’s that time of year when berries are in season! Right now, a pint of Blueberries is only $1 at Kroger (as opposed to $4-5 during the winter). Luckily, berries freeze well, so it’s a good time to stock up. By comparison, the same amount of “Kroger brand” blueberries bought in the freezer section cost $3.79. Alton Brown recommends freezing your blueberry pie filling for extra juiciness upon baking. You can also throw frozen berries in your breakfast smoothie, if that’s your thing. MY personal favorite is a Blueberry Muffin! Especially the ones at la madeleine… which I seriously want to replicate at home. Blueberries are superfoods, so these are super muffins, no? 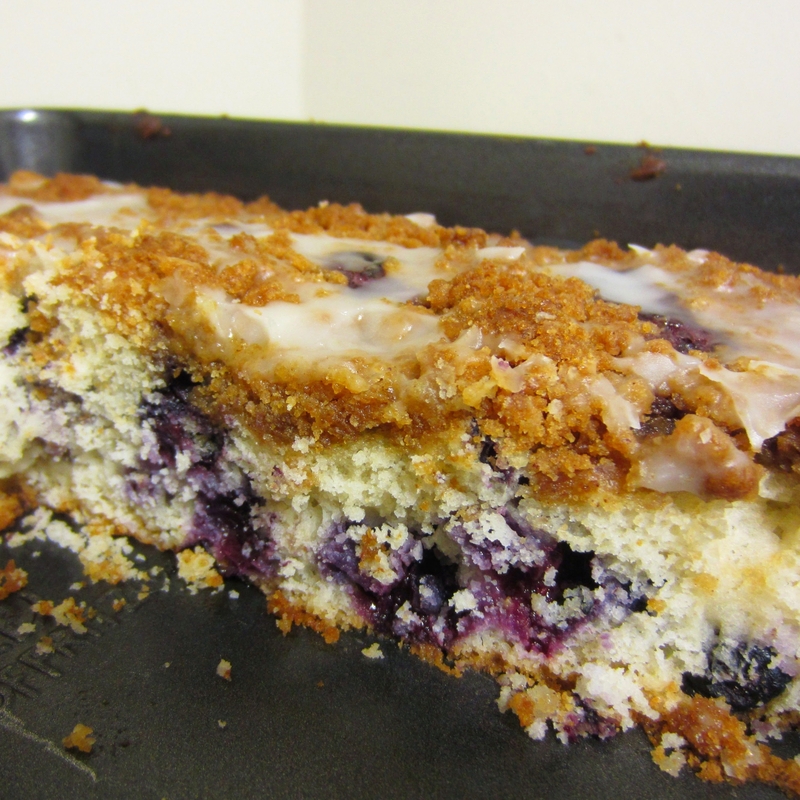 For a Blueberry Muffin in cake form, I’ve discovered the Blueberry Buckle (also recommended by Alton Brown). Buckle is an old-fashioned term for Coffee Cake. Which means this delicious dessert is perfectly suitable for breakfast or brunch. Or after dinner. I need to try this particular version a few more times before it becomes my go-to blueberry muffin-cake recipe. But at least I can guarantee you it will make your home smell heavenly when it’s baking. AND it only takes 1 egg (with stores rationing eggs, a low-egg recipe is seriously good news to any baker). In a bowl combine topping dry ingredients (sugar, cinnamon, flour). Cut in the butter with a pastry cutter or 2 knives until dry ingredients have combined well with the butter. If the butter is soft, you can use your fingers. There should be little clumps without a lot of extra loose flour mixture. Refrigerate topping while you make the batter. Using a stand-mixer, combine sugar and shortening until well blended (3-5 minutes). Add milk and vanilla extract. Mix again. Sift dry ingredients together in a separate bowl. Gradually mix dry ingredients into wet ingredients. Remove bowl from mixer. Gently fold in the blueberries with a spoon (try not to let the berries burst). The batter will be very thick. Put in a greased 8x8 or 9x9 inch baking pan and press batter out to the corners of the pan. Remove topping from refrigerator and sprinkle evenly over top of the cake batter. While cake is cooling on a wire rack, mix up the ingredients for a glaze, adding milk 1Tbsp at a time until it reaches the desired consistency. If it gets too wet and runny, add more sugar. Cover glaze until cake cools. After cake has cooled completely, use a spoon and drizzle the glaze over top of the cake. Enjoy your delicious breakfast [coffee] cake! If you try this recipe, please let me know what you think! If you have a great blueberry muffin recipe, I’d love to know that too. Comment below are send me a message.